This page provides an overview of Fisheries Victoria recreational fishing milestones and budget for the period of 2015-2019, including Target One Million funding. The state government is committed to creating fantastic fisheries through its $46 million Target One Million plan for recreational fishing, which aims to grow participation to one million anglers by 2020. Delivered over 60 events to encourage and promote recreational fishing. Recreational fishing has an allocated budget of $52 million for the period of 2015-2019. This budget is for the completion of all recreational fishing commitments including Target One Million. The graph below shows the percent of total allocated budget for recreational fishing commitments. Fig 1. 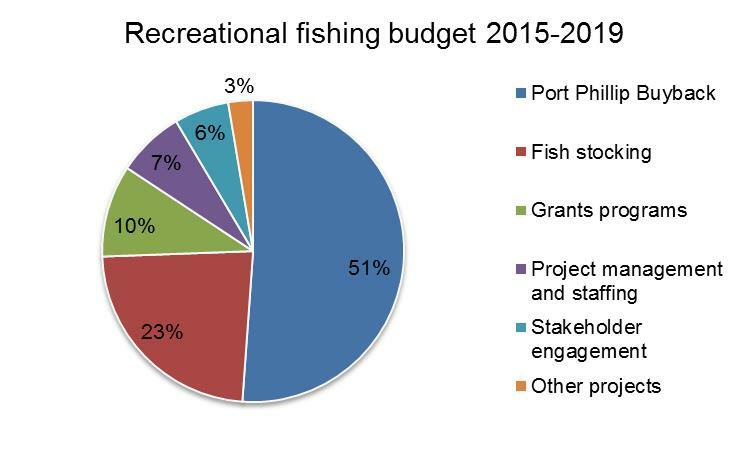 Recreational fishing budget by category. Target One Million committed to a phase out of all commercial netting of Port Phillip Bay over an eight year period beginning from the government's election in late 2014. The net buy back is an essential component of improving recreational fishing within Port Phillip Bay and increasing the number of anglers within Victoria to one million. Fish stocking is an essential component of managing our inland fisheries. Stocking is used to establish fantastic new fishing opportunities. Fisheries Victoria has been increasing the number of stocked fish in Victorian public waters since 2015 and is on track to deliver the government's Target One Million commitment to stock 5 million fish next year. Part of Target One Millions stocking commitments included stocking record numbers of, Murray cod, golden perch, bass, brown and rainbow trout into key Victorian waters. Grants programs are an essential part of Target One Million; funded projects deliver clear benefits to recreational fishers and boost participation. Over the past three years the Stronger Fishing Club grants program has seen projects provide countless benefits to recipient clubs. The feedback from recipients has shown the positive benefit the grants are having on improving participation and growing the sense of community within clubs. Development of educational and promotional products to grow fishing participation. Fisheries Victoria interacts with the recreational fishing community through number of events each year. A key driver in the success of these events has been angler's engagement with Fisheries Victoria through promotional products. Introduce reciprocal licensing arrangements with New South Wales.